Cook the cassava on medium heat for 15 minutes with enough water to cover them. Once soft, drain them, remove the fibers, and mash to create a puree. Mold the cassava puree into golf-sized balls and push one or two cubes of mozzarella into the center, depending on the size of the balls. Close well. Brush each ball evenly with beaten egg. Then, roll in breadcrumbs. Meanwhile, heat the oil in a deep pan over medium-high heat. When the oil is hot, add the cassava balls and fry until golden all around. Remove from the pan and let dry on a plate covered with paper towels. You can stuff the cassava balls with ground beef to make a typical Colombian appetizer. Cassava is one of the ingredients I always keep in my kitchen. I love how it tastes cooked in different ways, but fried cassava is my favorite. Another way I usually cook cassava is by boiling it with a little salt. 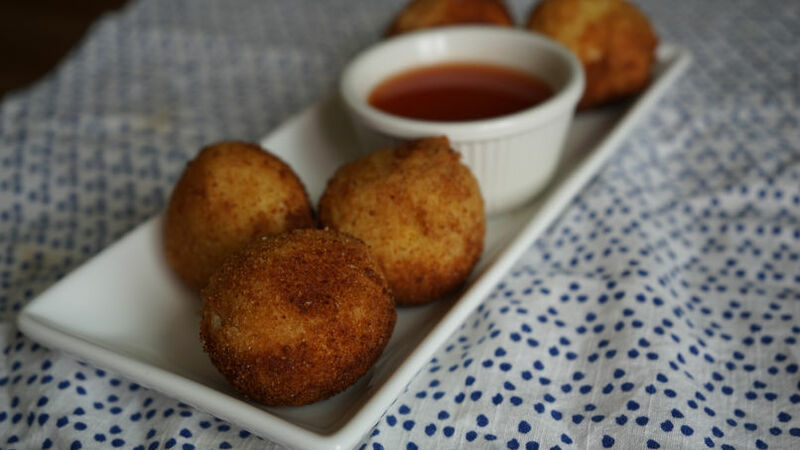 The recipe that I tend to make for special gatherings or events, however, is little cassava balls stuffed with cheese, a perfect appetizer that's very popular with my guests. This recipe only calls for a few ingredients and can be made ahead of time, saving time on the days you want to serve it.